The New York Times recently published a haunting piece about the black middle class in America. It isn't discussed enough that the sub-prime crisis not only brought the economy to its knees but also destroyed the public-sector job market upon which so many black middle-class lives have been built for half a century. Black households have also been twice as likely to lose their homes to foreclosure as white ones. Many black families now face losing their homes and jobs simultaneously. Never before has a generation taken it on the chin so directly, a fact that is exceptionally evident in the San Francisco Bay Area. I have been making maps lately as part of my attempt to understand and document what happened. Here are three maps that link the sad mix of population growth and foreclosure to the racial legacy of an even more segregated metropolis built a generation ago. The first map (above) shows where intense growth occurred. The red spots are towns, cities and a few unincorporated villages that grew by more than 50 percent over the past 20 years and added more than 5,000 people. I've started calling these places "50/5000 cities," partly to avoid the vocabulary of "fringe suburbs," "exurbs" and more derogatory terms that seem to occupy our regional vocabulary. Calling these places "fringe" implies that they are small or irrelevant. 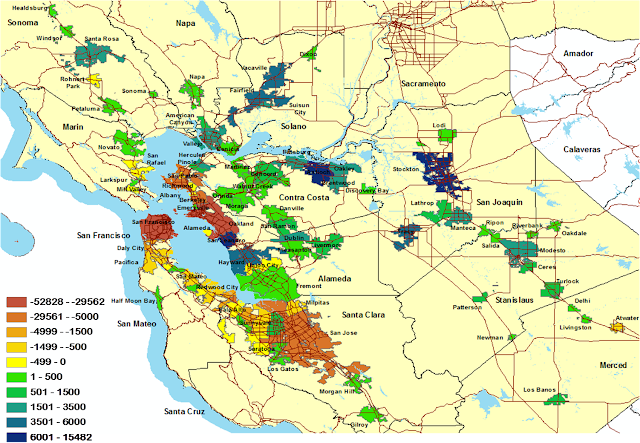 They may have been small, but the 24 Bay Area cities in the 50/5000 club are home to roughly 850,000 people. 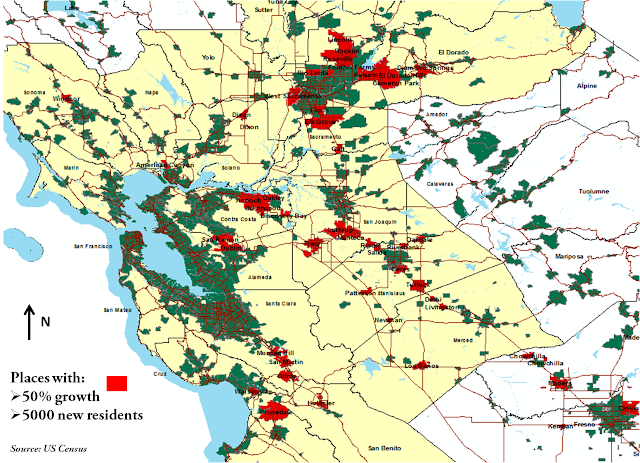 The 23 in the greater Sacramento area, which along with the Bay form the Sierra Pacific Megaregion according to Nelson and Lang, are home to another million. But these are not Phoenix or Miami — cities built in the desert or swamp with no prior history. For the 47 cities on the map, the median incorporation date was 1908, and the median founding date 1878. There is more history here than we remember — which is partly why we understand their growth so poorly. 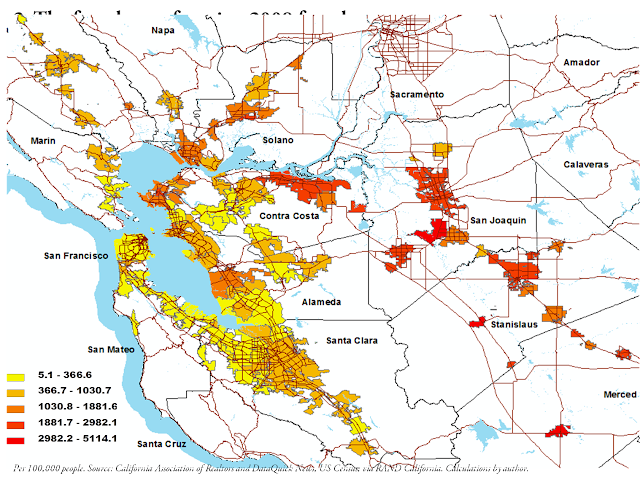 This next map (above) shows foreclosures; the redder it gets, the more there are. In the 50/5000 cities, the median foreclosure rate per 100,000 people in 2008 was 1,866. In the 74 Bay Area cities and towns not in the club, the rate was 317. San Francisco, which lost almost half its black population during this period, had roughly 70 foreclosures per 100,000 people. Stockton had more than 2,000, Patterson more than 5,000. No city in my beloved Eastern Contra Costa County had less than 1,800. Finally you have the map of African-American population growth from 1990-2010 (above). This is raw growth: just people, not percents. If your city is in the red-yellow range, it means that African Americans left. San Francisco is exceptionally red. If it is green or blue, it means that the black population grew. Antioch, with a population of about 100,000, welcomed almost 15,000 new African-American residents, roughly half the number that San Francisco lost. In 50/5000 places, median African-American population growth was more than 400 percent; in the rest, it was 10 percent. Hispanic population growth was not quite as uneven, but still almost two-and-a half times more pronounced than in the rest of the region's cities. Lest you jump to the conclusion that migration of communities of color somehow caused this calamity, the arrow of causality went in a specific direction. In forthcoming work done with my colleague Jake Wegmann, analyzing real-estate data in the region since 1988, we can show that the zip codes to which African Americans migrated were doing well in terms of median home value until 2005, long after the migration had begun. Not just well overall, but well against San Francisco's Cole Valley, one of the most gentrifying places around. Their presence in the fast growing portions of deep suburbia did not cause the crisis, and their decision to move made sense. If you were black and middle class, moving to places like Antioch and Patterson seemed like a good deal — a chance at a piece of the American pie and a rational economic decision. Nobody realized how shaky the terms of the deal would turn out to be. This is one of the many reasons that Chris Leinberger needs to change his tune. I agree that sprawl was a bad idea, that growth on the fringe helped bring the economy down and that urban centers are the heart of our global future. We've known this since suburbanization began in earnest two generations ago. But we failed to stop it. Now the "fringe" in Northern California alone is home to millions. And in the 24 Bay Area cities in the 50/5000 club, almost half a million of the 850,000 residents are not white. These are generally hard-working families who followed the same suburban path the white masses went down a generation or two ago — except much farther from city centers and with worse debt, less job security and no real mass transit. This is a generational raw deal hatched at every scale of our urban development. The foreclosure crisis is a national tragedy that hand-wringing about the failures of sprawl will not undo. Predicting the "death of the fringe suburb" is reminiscent of the harmful language used to describe cities in the days before urban renewal, when we labeled the neighborhoods of the working classes and communities of color as "slums" and "ghettos," bulldozing what we could and redlining the rest. This massive and exceptionally racist failure of urban policy in the post-war era laid the groundwork for this crisis more than a half century ago. While we were busy destroying inner cities and building nice suburbs, we denied African Americans the right to move out as well. Sprawl is now a lived reality for the exceptionally diverse community once called the American middle class. We must deal with what we have wrought where we have wrought it, not call for a demise that would heap further misery upon communities that certainly do not deserve it, no matter how much we wish it had happened some other way. Credits: Maps by Alex Schafran. Drawing from the New York Times. I can see the effect of recession. I'm a Brazilian architect and planner currently involved in a post doctoral research in which my group and I were developing an approach using social housing as the core element to improve neglected areas, located at Sao Paulo central districts, in order to avoid (or at least to give another option to) the urban sprawl. I liked the analysis you've made here and I would like to know other papers or essays on this subject (meaning gentrification and race). Are they available? I'd be happy to help you out. Send an email to info@thepolisblog.org and we can start a conversation offline.